Electric Cars - Worth the hype? The next 12 months will be a big test for electric cars. After years of hype, several prominent auto manufacturers are finally releasing new electric vehicle models for sale to the general public. The Chevy Volt and Nissan Leaf are just two of several new EVs that you’ll soon see driving along streets and highway. 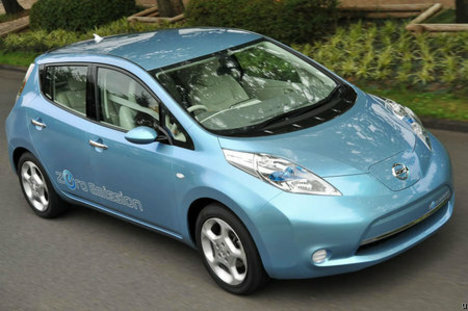 There has been quite some debate over the question of can electric cars go mainstream? After the famous documentary, Who Killed the Electric Car, there are many that still believe that their batteries are too expensive, the travel ranges are too small, and plug-in/recharging too inconvenient. At the recent Washington Post Energy Conference, an expert panel on electric vehicles addressed some of the questions and concerns on the minds of consumers considering this new way of commuting. So now you’ve read what the experts are saying… what are your thoughts? Can electric cars go mainstream? 1)It’s ridiculas. Example: a golf cart batteries weigh 500lbs and can only go 15MPH for 6 hours. 2) Tomorrow, if everyone switched to electric cars, the first night they all plugged them in it would crash the entire US grid. The US doesn’t create enough electricity to power all the US cars. 3) Gas is cheaper … and as long as gas is cheaper, electric cars won’t be mainstream. Also consider tha electriciaty is still created by a process that either 90% nuclear or coal. So right now it is simply creating a cleean burning car from a dirty power source. No advantage. Americans have been ready to embrace the electric car for decades. Will the big corporations kill it again this year? Let’s…….. live. I’m surprised at how little attention auto pundits give the price issue. The bottom line is that MOST families simply will not or can not pay $35k-$40k for a car. The bottom line is that MONEY is the HUGE factor in car buying decisions. For every enviro-dork who buys a Prius on principal (and let’s get serious, most of our electricity still comes from burning fossil fuels) there are 1000 more buyers for whom money trumps eco-conciousness. Good thing they don’t use golf cart batteries. They also don’t use AAA batteries. obviously itll be main stream. people are finally waking up to the fact that the money we spend on middle eastern oil directly and indirectly fuels terrorist organizations. of course environmental issues are a determining factor, but security will be the main factor. the general media and companys’ issue conservative guidance that way its easy to meet expectations and beat which will translate in higher share price. competing car companies are most likely discussing this as i type lol. most in north america use automatic so it wouldnt mean anything if they switched to electric. range also wont be a factor thanks to the ridiculously fast growing infrastructure. True, but define “come close”. If we do transition to something other than oil, that will take a long time, so we need to start at least that long before we run out of oil. Some would say we’re past that point already. For it to become mainstream, I think one thing that needs to happen, is that we make some changes to our power grid. We need a power grid that is more sustainable and scalable. One that uses a fuel that can be replenished as fast as it is consumed, and one that can handle the additional strain that will be put on the grid by everyone charging a car each night. @chrislang Golf cart batteries definitely don’t weigh nearly that much. Maybe if your golfcart is 100 years old. Chris Lang, your comment is comical. You have totally missed the point. 1. The cell technology in the new electric cars is not comparable to that of a golf buggy. 2. Burning fossil fuels in a power station is an overall more efficient power source than burning petrol/diesel in a motor vehicle. It’s the lesser of two evils in my opinion. Development is clean grid energy also need to be improved. Aside from the waste, Nuclear power stations (or nuclear reactors to be more precise) do not emit carbon dioxide. 3. Supply and demand. The car manufactures couldn’t replace all the cars in America over night, and the population will take a long time to convert. As power demands increase, so does supply. Basic economics. These cars are fantastic. People will change over in time and fingers crossed a difference will be made to the environment. Without ranting, the world needs more technological developments like this or we don’t have long left. At current rates of growth, the population of earth will reach to 9 billion by 2050. Do the sums. 15MPH * 6 hours = 96 miles. Ok so lets change up the car a bit, getting higher voltage requires a little more weight, but thats ok. So it’s likely like many Americans travel only <60 miles. (You can find that study). Not everyone needs to switch to an electric car, let alone do it overnight. Not every car has to be electric. Any affect will be gradual, so I don't think capacities of nuclear and coal power plants can't keep up. You clearly do not understand the economics of maintaining an electric car. Paying for operating costs of an electric car is at least a 10th of a gas powered one. Electricity is significantly cheaper and significantly less wasteful and efficient. Aside for the power source, the cost of maintaining and electric car is insanely cheaper, no oil filters/changes, there are very few moving parts and as such requires less replacement etc, etc. And who said power from Coal and Nuclear plants were dirty. Coal has double the efficiency and nuclear has about 3-4 times efficiency of a car engine. Can I ask how it would be bad if many people used less energy and spent less money doing the same amount of work? It's better to educate yourself on the facts of electric cars and use some common sense when making such arguments. There are many challenges and difficulties arising electric cars, but as unstable prices of oil and gas create higher expenses, people with ideas and vision may make it possible better options then the oil monopoly that exists today. the Chevy volt is not a EV, its just a plug in hybrid. those are mainstream already. But yes, electric cars are the future. The Wall Street Journal, and many other publicans writing on the merits of EVs and the speculation of their acceptance miss crucial sources of information that would clear up so many of the questions. These SUVs and pick up trucks are pure battery electric and sport HiMH battery packs. In the case of the Toyota’s, there is a very tight user’s group who communicate daily on the status of the vehicles. We recently celebrated one RAV having traveled past the 200,000 mile mark with his EV. This represents the world’s longest traveled production EV, at least in private hands. The original battery pack was swapped at just past 150,000 miles. The people who drive these EVs are the perfect group to ask whether their daily driving needs are met by a car with limited range and very limited public charging infrastructure. If you were to ask them, they’d tell you how the range is perfectly fine for virtually all of their driving. It would be nice to have more charge stations, but that’s not a requirement for practical use. We have 8-10 years experience driving these cars. Ask us the next time you write one of these articles. You’ll get a very accurate sense of what the general public will experience. The transition to electric drive will happen much faster than most of the pundits can even imagine. He’s my prediction. Full disclosure, I recently started working for Nissan selling the LEAF. 2015 – 1,000,000 PAVs sold. After that, it ramps up fast. All the predictions I see neglect to consider what peak oil will do. I am confident the OEMs won’t be able to keep up with demand. Just read the interviews with the LEAF and Volt buyers starting in January. You’ll understand what I mean.